I think it’s important to start this recipe with honesty. I hate eggplant. There, I said it. Whew! Weight off of my shoulders. Thanks for understanding guys, see ya later! Just kidding! I’m still here. I can’t very well make a anti-eggplant statement, and then leave you without some further explanation. So here I go. The truth is, no I really don’t like eggplant. My mom always gets annoyed and tells me I have to like eggplant, because I can’t be a veggieist while being vegan. That’s too picky! …Ok well she doesn’t really call me a veggieist, but I thought it was pretty funny. So far, I have only found one way I actually enjoy eggplant, and that is when it’s turned into eggplant bacon. I think you could bacon-ify anything and it would taste pretty darn spectacular. It’s rare that I make eggplant bacon, because it lasts for about 3.5 seconds in my house. So when I saw the shiny, purple eggplants sitting there all pretty, I felt guilty (yes I get vegetable guilt) and so I took that beauty home. …Now to make it taste good. Andrew also doesn’t like eggplant, so he wasn’t particularly excited when I told him what my cooking plans were. Audrey (our pooch), seemed even less interested in the eggplant. So team eggplant wasn’t winning yet. I knew there must be some way to be on the eggplant team! 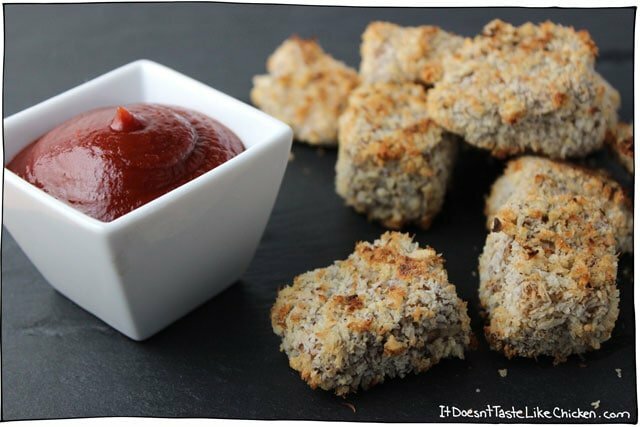 Then it struck me, well, pinterest struck me, and I saw a recipe for coconut chicken nuggets. While there will be no chicken tasting on this blog, I knew I had found my inspiration! Boy was I right! These things were so darn good, Andrew and I polished off the whole entire eggplant in one go! Crispy, panko and coconut on the outside, soft and creamy on the inside. The eggplant looses all of those mushy qualities that I hate, and becomes this gorgeous, light, munchy snack. These Crispy Coconut Eggplant Nuggets are the way to eggplant bliss. When you are looking for me at the grocery store, you can find me whispering sweet nothings to the eggplants. Now there is no doubt that frying these nuggets is delectable, because hello, frying! The exciting news (for me), is that they were basically the same amount of deliciousness when they were baked. They turn out just as crispy on the outside and dreamy on the inside. Both methods were so good that I gave instructions for each. So it’s up to you what cooking method you choose. Either way, eggplant haters unite! This is your chance to not hate eggplant. 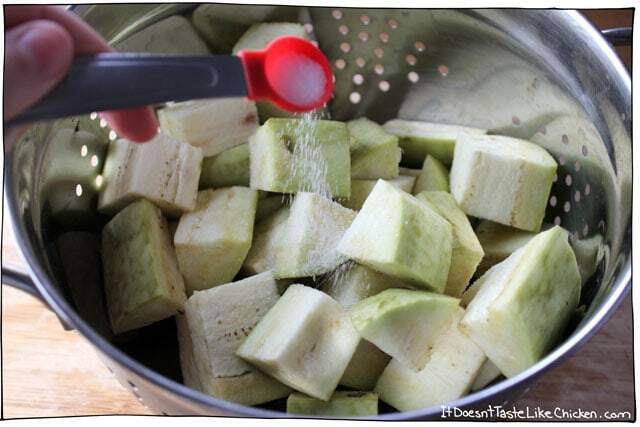 To make the nuggets, start by using a potato peeler to peel the eggplant. Eggplant skin is eatable, but it doesn’t work well in nugget form, so get rid of it! Cut your eggplant into nugget sized pieces. Try to get them roughly the same size so they will cook evenly. Put them in a colander and put that colander in the sink or on a towel. Sprinkle the eggplant with the salt, and then use your hands to toss them to coat. Let the eggplant rest while you prepare the remaining nuggets. They might start dripping liquid, and that’s a good thing. Prepare your bowls! 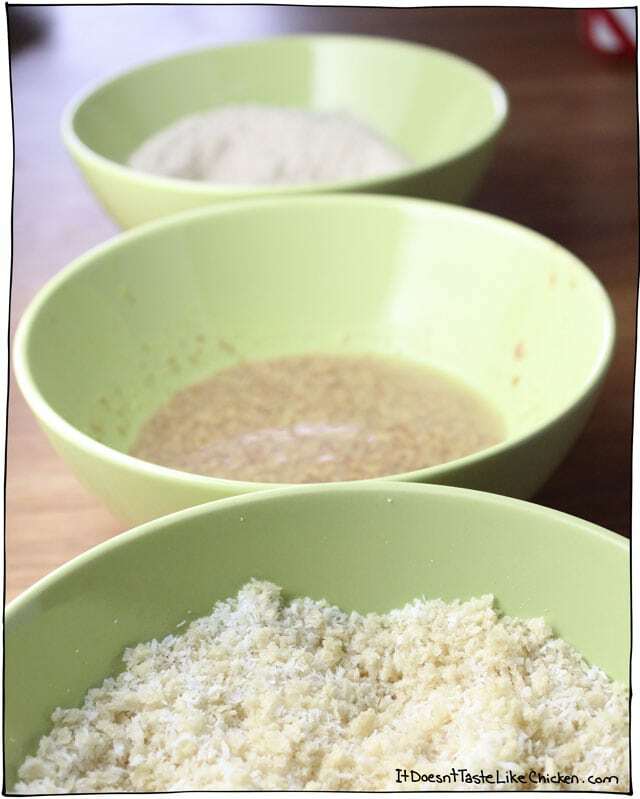 Get three medium bowls, in one bowl mix the flour and season with salt and pepper. In the second bowl, mix the flax and water. In the third bowl, mix the panko and coconut. The flax mixture will need to rest for about 5-10 minutes to thicken. Use a fork, or your fingers (I found a fork was easier to use), to pick up a piece of eggplant. 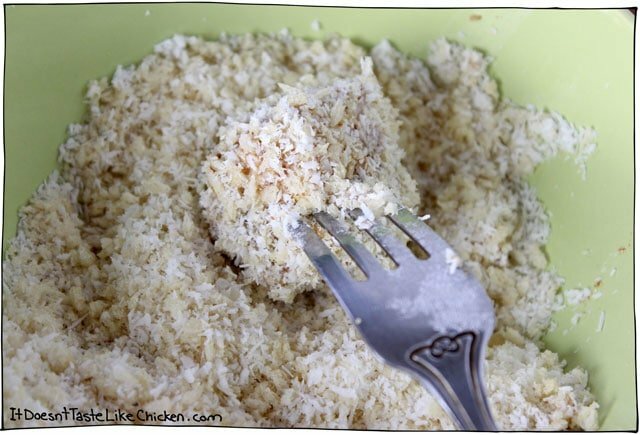 Dip it in the flour mixture and shake off excess, then dip it in the flax mixture, and finally coat in the panko and coconut mixture. Set on a plate and repeat the process with the remaining nuggets. Choose your cooking method! If you are pan frying them, pour about 1/2″ of oil in a pan. Heat up and test that it is ready by dropping in a small piece. If it bubbles and sizzles you are good to go! If the oil starts smoking, lower the heat. Careful! Working with oil is dangerous. Put several nuggets in the pan and fry them for about 2 minutes on each side, until they are golden brown all over. Set the fried nuggets on a plate covered in paper towel while you finish the rest. If you want to bake them, line a baking sheet with parchment paper. Lay the nuggets out in a single layer so they aren’t touching. Bake at 450F (230C) for 18-20 minutes, flipping them halfway through, until they are golden on all sides. Serve while hot with your favourite dipping sauce! Crispy, panko and coconut on the outside, soft and creamy on the inside. The eggplant loses all of those mushy qualities that I hate and becomes this gorgeous, light, munchy snack. Can be baked or fried. To bake the nuggets: preheat the oven to 450F (230C). Put the eggplant nuggets in a colander in the sink, or over a bowl. Sprinkle the salt across the eggplant and toss with your hands to evenly coat. 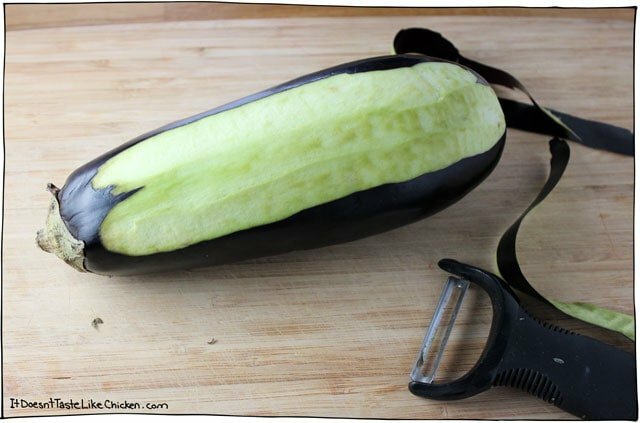 Let the eggplant sit with the salt on them in the colander while you prepare the rest. In the meantime get three medium bowls ready. Bowl 1: add the flour, and season with a pinch of salt, and a few grinds of pepper. Stir to combine. I used whole wheat flour but almost any flour will work here. Bowl 2: mix together the ground flax with the warm water and set aside. The flax mixture will need to rest for about 5-10 minutes to thicken. Bowl 3: mix together the coconut and panko. 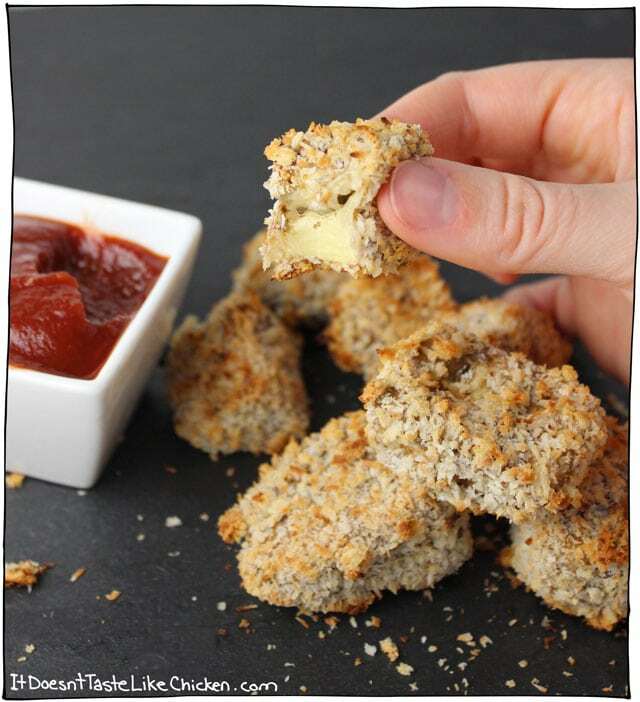 Now take your first eggplant nugget and dip it in the flour covering all sides. Shake off excess, then dip it in the flax. Shake off excess, and toss in the coconut and panko. Set the nugget on a plate and continue with this process for the remaining nuggets. I found it easiest to do this with a fork as your fingers will get all goopy. As you go the flax mixture might get too thick, so just stir in a bit of water as needed. If any of the bowls run out, just add more as needed. If you are baking your nuggets: line a baking sheet with parchment paper. Lay the nuggets out in a single layer so they aren't touching. Bake in a 450F (230C) over for 18-20 minutes, flipping them halfway through, until they are golden on all sides. 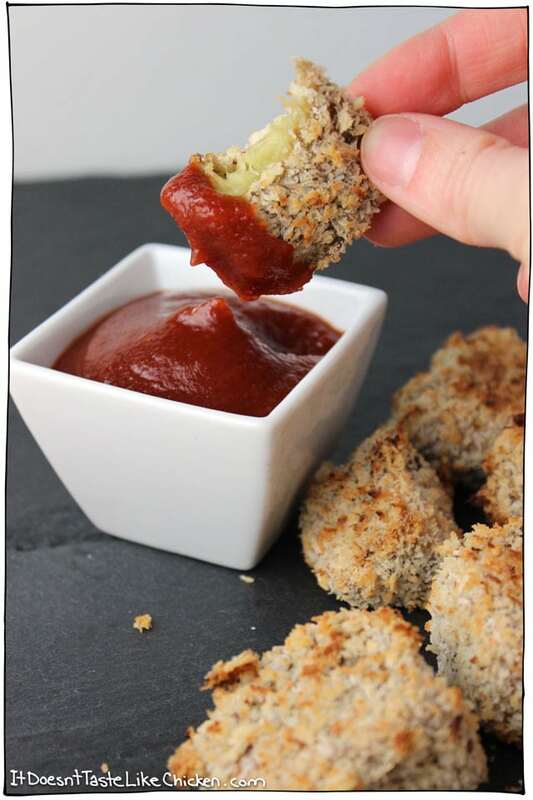 Serve the nuggets while hot with your favourite dipping sauce. If you are frying your nuggets: pour about 1/2" of oil in a pan. Heat up and test that it is ready by dropping in a small piece. If it bubbles and sizzles you are good to go! If the oil starts smoking, lower the heat. Careful! Working with oil is dangerous. Put several nuggets in the pan and fry them for about 2 minutes on each side until they are golden brown all over. Set them on a plate covered in paper towel while you finish the rest. 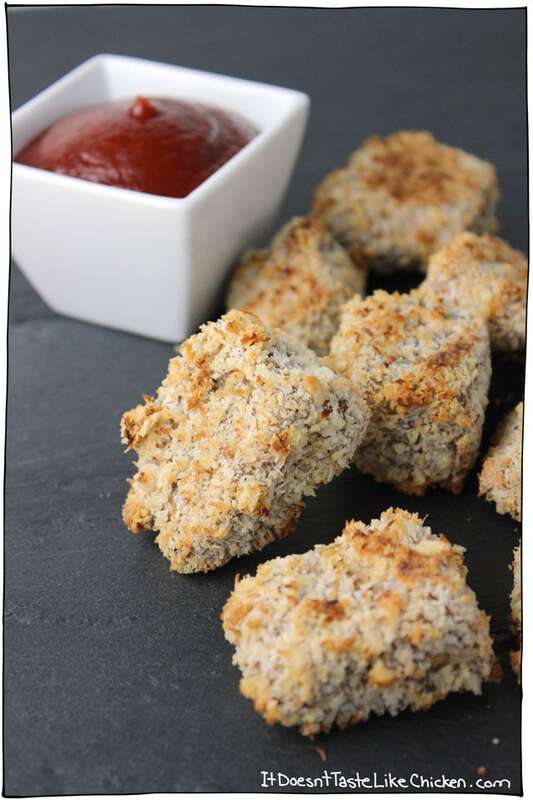 Serve the nuggets while hot with your favourite dipping sauce. For gluten free option use whatever your favourite gluten free flour is, (any flour should work fine), and use gluten free Panko, which you should be able to find in health stores. Featured Ingredient: Eggplant. 44 Days, 27 Recipes to go! These were so tasty! I used a Chinese eggplant and it worked great, even with some of the skin being left on. We used sweet chili garlic sauce for dipping and served them with salad and rice. They even reheated well the next day in the toaster oven. Yumm! WOW these are incredible. To make it a little easier I just mixed the flour, coconut flakes, and panko together in a bowl with some water and tossed the eggplant chunks in it rather than having separate bowls and dealing with ground flax. Came out great! Thanks for the wonderful recipe. Delicious! My garden gives me a ton of eggplant (we grow the Japanese eggplant, long and skinny) and this was such a nice change from my regular curry. The coconut coating was amazing! I will be making these again. Thanks! Yay! So happy you enjoyed them so much Tara. I should totally grow eggplant next year! These were amazing- We baked them and they were still really crispy. My 15-month old LOVED them! Thanks! Here’s a question! 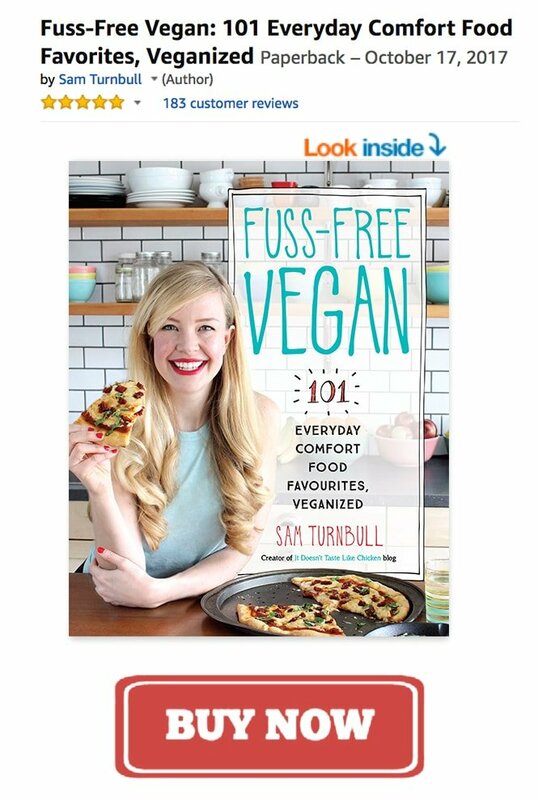 I’m forever searching for vegan recipes I can make ahead of time and bring to work with me. How well do these hold up or next-day microwave use? I haven’t tried microwaving these, because I don’t have a microwave! Also, when I have made them, there are never any leftovers. Haha. I think some recipes that might work well for this are the Baked Zucchini Fritters, the Jerk Sweet Potato & Black Bean Burgers or the Smoked Apple Veggie Burger, and for a cold lunch, try any of these 5 Vegan Sandwiches. Hope that helps! Hi Sam, Love, love, love your picture. So sweet. Anyway, I always find it a bit annoying when I read a recipe online that says it is wonderful but then the people write in and say, “Oh, it is so good but I changed this and this and this…” Well, I am now guilty of that! I am vegan who uses almost no oil and never use oil with eggplant because it soaks it all up and becomes a giant oil sponge. I was so pleased to see this recipe that looked good and had no oil. But, I had the long, light purple Asian eggplant in stock instead of the typical. I had the whole wheat flour, coconut and the flax meal but my panko was the seasoned Italian style. I wanted to make it though so I plunged ahead. I cut the eggplant into half-inch rounds, and did not peel them, put it all together and baked it as instructed. You are a genius! It turned out so delicious and looked beautiful. Since it was vaguely Italian, I used pizza sauce as a dip, but liked it better just plain. Next time I will make it non-Italian, but I will stay with the Asian eggplant. If you have an Asian market anywhere near you, they usually carry it. Thank you so much for this! So happy you enjoyed the nuggets so much, and thank you for coming back and leaving your review! Made these last night, Sam. And WOW! What yummy little nuggets. I’m relatively new to eggplant myself, never really sure what to do with those big boys… but my hubby makes a mean Eggplant Parm (we just need to veganize it). I baked these nuggets and they turned out so great. Hubby loved them, 22 month old daughter loved them, I loved them. I told hubby that the breading/baking would be good for his Eggplant Parm … good thing I bought him an eggplant too (hint to hubby!). Haha that’s awesome!! Both that you loved the taste and the look. I love when that happens (it doesn’t always work for me either!). I haven’t wrapped my tastebuds around eggplant parm yet, but maybe one day… it’s one step at a time with eggplants for me! haha. Here’s a secret. The worst tasting eggplant in the world is the type you buy in the store. It is bitter and tasteless and most often cooks up soggy. There are a LOT of really tasty eggplants out there. I grow six kinds of heirloom eggplants and they are to die for. Tasty, crisp and not even a hint of bitterness. All colors of the rainbow and all sizes for different kinds of dishes – big rotund ones for eggplant parm to little nugget size for pickling. There are about 20 different types at least to choose from. Wow! Send me some of your eggplants Davilyn! I would love to grow some eggplant, what is your favourite and where can I get the seeds or plant? OMG, these look amazing! 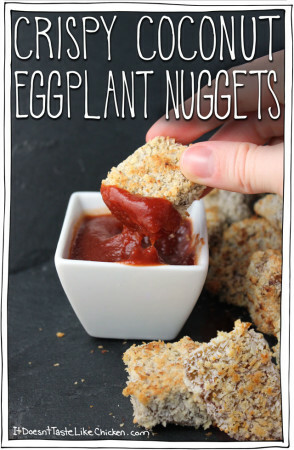 I love eggplant and can’t wait to make these. Pinned! Haha, thanks Linda! I loved them, and if an eggplant hater loves them, I am sure an eggplant lover will love them even more! Sorry, Mom: 25 years of veganism, and I loathe eggplant too. Bitter, slimy, soaks up so much oil you could use it for marine disasters. So I will try this recipe with zucchini instead. Oil-drenched seagulls, you can have my eggplant. Haha! Well the good thing is, that you don’t even have to use any oil in this recipe, and the eggplant becomes soft and creamy (instead of bitter and slimy). I love it in this recipe. I am not sure how zucchini would work, but if you give it a try, let us know how it turns out! I just discovered your blog, and have made the Poppyseed Lemon Loaf (yum!) and the Shortbread (also yum!). In both cases, I substituted gluten-free baking mix, and it was a more successful substitution with the poppyseed loaf, for my tastes anyway. Now that I have my sweet tooth satisfied, I can move on to some of your savory recipes. Thank you for the tasty recipes and inspiration! I have to make these! I am an eggplant fan when the mood strikes – but the mood strikes more often for something like “bar food.” This will be a good “bar food” crave satisfier. There’s some creative language for you ha ha. Thank you for your wonderful recipes! I actually enjoy nachos again because of that red pepper cashew cheese! I love bar food crave satisfiers! You are speaking my language Kathy. So happy you are all into the red pepper cashew cheese too. I love that my recipe are making bar cravings be satisfied!